Roger Bresnahan was a premier catcher at the turn of the century. Beginning his career as a pitcher, he moved to the outfield, then became a catcher with the New York Giants. He helped lead the Giants to championships in 1904 and 1905, hitting .313 in the 1905 World Series. He developed the use of shin guards and other protective gear that prolonged the career of catchers throughout Major League Baseball. Outfielder and manager of the pennant winning Pittsburgh club, Fred Clarke led the National League in walks, putouts, and doubles in a career that lasted from 1894 through 1915. He managed his team to three consecutive pennant 1901-1903 and participated in the first World Series. His team won the 1909 World Series when he hit two home runs and drove in five runs, while scoring seven runs himself. His career average is .312. 1 OK, Clarke makes sense, but Bresnahan? I am stunned at the amount of contemporary ink used to extol Bresnahan’s work with catching equipment. He’s considered an innovator (some even claim he invented the shin guards–he didn’t) who prolonged the career of innumerable catchers, made the game safer for catchers, and improved the quality of work behind the plate. It’s almost as if his batting numbers didn’t matter to the writers of the era. I checked his DWAR (which didn’t exist at the time so I didn’t use it in picking or rejecting him, but I wanted to check something) and his number rises significantly once he goes behind the plate, goes up even more when he puts on the “tools of ignorance” and stays up until he moves to St. Louis where he plays less and manages more. I believe that a contemporary bunch of writers who remembered him might have decided that the contributions to catching were enough to elect him to a Hall of Fame existing in 1920. And it’s the “contributions” word that’s important here. It’s almost as if his contemporaries might have added him more as a contributor than as a player. That explains why I chose a picture of him in gear rather than a shot that allowed us to see his face. As a player only, I’m not sold on his enshrinement either in 1921 or today. 2. Clarke was pretty easy. He was a very good player and a very good manager. Put them together and he’s an easy call. And by the way, he’s the one who decided to move Honus Wagner to shortstop as his primary position. Maybe he ought to get in just because of that. 3. There are a couple of significant additions to the list of players eligible for 1922. The most notable everyday player is Nap LaJoie, while pitchers Christy Mathewson and Mordecai Brown show up. I suppose it won’t be a shock to anyone if all three of them are in the final class of this year. Others involved in the 1922/23 classes will include Harry Davis, Hans Lobert, and Athletics co-owner Ben Shibe. 4. I can already hear it now, “Who the heck is Hans Lobert?” Most of you are probably asking that at this point. He’s a decent, but not spectacular infielder, but he’s inordinately well-known and well liked. I’m surprised at how much contemporary stuff there is on an otherwise, to us, obscure ballplayer. I’m trying to find out as much as I can about him (for instance Edward G. Robinson played him in a movie) for maybe a post here, but more importantly I’m trying to determine if the writers of the day liked him (and we’re talking liked him as a human being not as a player) enough to have given him consideration for a Hall of Fame. I don’t think so, but it’s interesting to check. I’m convinced that “likeability” is a feature in getting some players (but certainly not all) into the real Hall of Fame so here’s a chance for me to examine that idea. I’m sure that a bit more searching around could produce a better team. I purposefully left out Stan Musial who made the switch in the minors. Of note is that most of them occur in very early MLB history. It isn’t so common to make the switch at the Major League level anymore. Obviously in the case of the Hall of Famers, it worked out pretty well. Anyway, I thought it was interesting and pass it along. BTW if you get a chance, make sure you take a look at The Baseball Attic. Certainly worth a look. And now concluding a look at where all three Major Leagues stood on 28 June 1914 (100 years ago tomorrow), the day that the assassination in Sarajevo set off the spark that led to World War I, here’s a view of what was going on in the National League. The National League had the most games on Sunday, 28 June 1914. Both of the other leagues had three games, a double-header and a single game. The NL went with twin double-headers. In one set Pittsburgh played two in Cincinnati and in the other the Cubs took on the Cardinals in St. Louis. the Reds managed to sweep both games from the Pirates. In game one they rallied late to take a 7-6 victory. Pittsburgh scored a run in each of the first three innings, got three more in the seventh, and led 6-2 going into the bottom of the ninth. Joe Conzelman, in relief of Babe Adams started the ninth, couldn’t get anyone out, and left the job to George McQuillan. McQuillan got two outs, but never got the last, as Cincinnati plated five runs, all earned, to win the game. Heinie Groh of “bottle bat” fame had two hits, scored a run, and drove in one. But the big hero was center fielder Howard Lohr who had three hits (all singles) scored two runs, and drove in three. In game two the teams went the other way. In the second, Groh singled, then came home on another single by left fielder Harry LaRoss. It was the only run that starter Marty O’Toole gave up, but Cincinnati starter Pete Schneider picked up his first win of the season by throwing a complete game shutout. 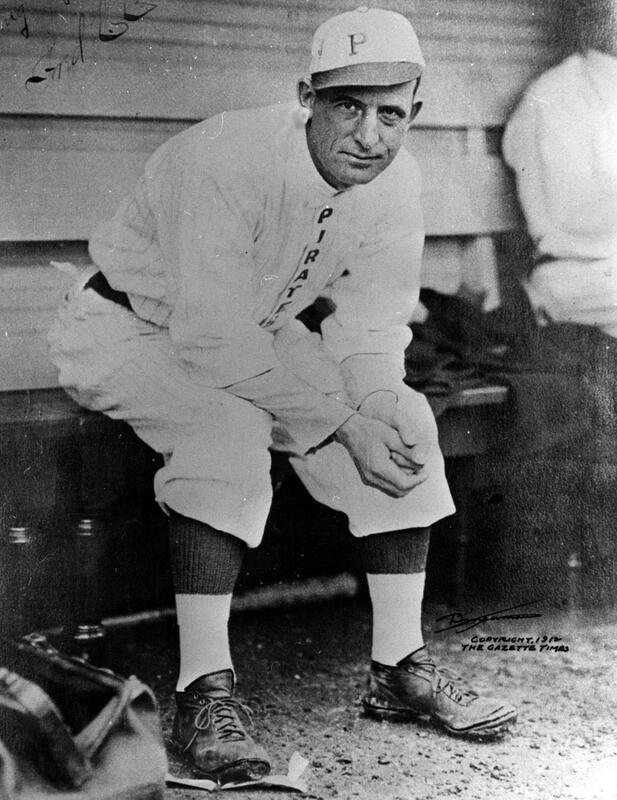 For the day Hall of Fame shortstop Honus Wagner went one for seven with an RBI, while fellow Hall of Fame player Max Carey went one for seven and scored a run. In St. Louis, the two teams split the double-header. In game one the Cards routed Chicago 6-0. The hitting stars were Lee Magee and Dots Miller. Magee scored two runs and had an RBI while going two for two with two walks. Miller went two for four, but drove in three runs. Pitcher Bill Doak threw a complete game shutout. In the nightcap, with the scored tied 2-2, the Cubs erupts for six runs in the fifth. Tommy Leach two runs, Vic Saier had three RBIs, and Hall of Fame catcher Roger Bresnahan had both a run and an RBI from the eight hole. With the score 8-2, St. Louis rallied for two runs in the eighth before Cubs ace Hippo Vaughn entered the game. He gave up one more run, but then shut down St. Louis to record his only save of the season and see Chicago pull off an 8-5 victory. Hall of Fame umpire Bill Klem had the plate for both games. At the end of the day, Cincy stood in second place, five games behind the Giants, while the Pirates held down fifth place (and were the highest placed team with a losing record). The Cubs were in third and the Cards in fourth. By the end of the season the Cards had risen to third, the Cubs were fourth, the Reds had slipped to last, nine games below seventh place Pittsburgh. One major trade occurred that day. The last place Braves sent Hub Perdue, a 2-5 pitcher to St. Louis. They got back first baseman Possum Whitted and utility outfielder Ted Cather. Whitted moved into the clean up spot for the Braves and Cather became part of an outfield platoon. Both men were instrumental in the “Miracle Braves” run to the NL pennant and the World Series triumph in 1914. The run began 6 July when Boston ran off seven of eight wins to start the climb to the top. It’s been a while since I stuck my foot deep in my mouth and picked an all-time team for a franchise. So it’s time to do it again. I’ve spent an inordinate amount of time this month dealing with the Giants, especially the New York version, so it seems like a good franchise to work with now. A few caveats first (you knew I’d do that, right?). 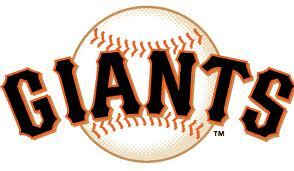 Let me start with a simple disclaimer: I’ve never been a particular Giants fan. Growing up supporting the Dodgers, there’s not a lot of nice things to say about the Giants (only the Yankees are as deep in perdition as the Giants). That means I’ll admit to being less than confident about my choices, but it’s the best I can do using only research and a few memories. Second, I put together a 25 man roster that does not mirror a Major League roster, but it’s my list and I get to do it my way. There are nine infielders, five outfielders, two catchers, and nine pitchers. I decided to go with three bullpen men and six men who were primarily starters. I also picked a manager (bet you can guess him). Finally there are no players whose primary career is before the advent of the mound. There are som really fine Giants prior to 1892, like Roger Connor, Tim Keefe, Mike Tiernan, but they play a game that is different, so different I decided to drop them from consideration. So with all that said, here we go diving in where God knows what we will find. Each list is alphabetical. The Infield: Will Clark, Al Dark, George Davis, Art Fletcher, Frankie Frisch, Travis Jackson, Jeff Kent, Johnny Mize, Willie McCovey. Did you ever notice that the Giants have produced an inordinate number of quality first basemen? I chose McCovey, Mize, and Clark (and Cepeda spent a lot of time at first) and left out Hall of Fame first sackers Bill Terry and George Kelly. Frankly, I didn’t really have to think that hard about it. The only hard choice was Mize, who spent significant time with both St. Louis and the Yankees. I decided he was in. If they’ve had great first basemen, they’ve had mediocre third basemen. I went with Fletcher as the only third baseman because the rest of the list was Fred Lindstrom and Jim Davenport and guys like that. OK, maybe I should have considered Sandoval, but as a rule I like to stay away from current players because we don’t know how they’re stay with their team will go (but see Posey below). Short and second were mixed bags. Frisch, Kent, and Larry Doyle stood out but there wasn’t much below them. Short on the other hand had more quality players, but no one at the level of either Frisch or Kent. I left off Dave Bancroft and added Dark which may strike some as odd, but I suppose it’s merely a personal preference. And of course Jackson (who was in the top 10 Giants in WAR, which surprised me) played third toward the end of his career. The Outfield: Barry Bonds, Orlando Cepeda, Monte Irvin, Willie Mays, Mel Ott. There is Bonds (whatever you think of him as a person or as a steroids user), there is Mays, and there is Ott. Everyone else is a huge drop, a really huge drop. You could make an argument that across the three outfield positions (left, center, and right) the Giants may have the best starting outfield ever. But you need backups and at the point you get past the big three you end up with a lot of quality outfielders. Cepeda’s knees sent him to first, but he began in the outfield. Irvin was a converted middle infielder who lost several years to segregation. Both are just short of the top-tier. I had to leave out both Felipe and Matty Alou, which I was sorry to do because I’d liked both when they played. Jeff Leonard and Kevin Mitchell were good for too short a time to be considered at the top. The Catchers: Roger Bresnahan and Buster Posey. OK, who else was there? Look at the Giants’ list of catchers and tell me you like anyone better. As a rule, Giants catching has been very weak. Buck Ewing is excluded as a pre-1890s player. Hank Severeid maybe, but if that’s the best you can do then we’re stuck with these two. I hesitate to pick a current player like Posey, but it’s a really weak position and Posey has the advantage of coming to the Giants and they win a World Series. Then he gets hurt and they falter. Then he’s healthy again and they win another World Series. That’s a pretty good legacy, isn’t it? The Starters: Carl Hubbell, Juan Marichal, Christy Mathewson, Joe McGinnity, Gaylord Perry, Amos Rusie. You know, you could make a pretty fair five man rotation for the Giants just using pitchers whose last name began with the letter “M”. You could dump those bums Perry and Rusie and insert Rube Marquard and Sal Maglie and still have a darned good staff. I didn’t. I have a feeling that in a few years both Lincecum and Cain will be getting some consideration on lists like this. The Bullpen: Rod Beck, Rob Nen, Hoyt Wilhelm. Not the strongest part of the Giants history. Wilhelm made the Hall of Fame, but his tenure with New York was relatively short. Most of his Cooperstown credentials are from other teams. Nen and Beck are simply one, two in saves, so why not? The Manager: John J. McGraw. Surely you saw that coming. So there it is in all its glory; for good ,bad, or indifferent. I think it’s a pretty fair list, but I’m sure a lot of people will disagree. Feel free to do so. (I have this nagging feeling I’ve left somebody out). 1. He was born 11 June 1879 in Toledo, Ohio. 2. Graduating from High School in 1895, he joined the Ohio State League in 1896, both pitching and catching. 3. In 1897 he made it to the National League with the Washington Nationals (not the same club as today) as a pitcher. He threw a six hit shutout in his first game 27 August, went 4-0 in his pitching assignments, hit .375, asked for a raise, and was cut at the end of the season (which should help explain why Washington never won a NL pennant). 4. He spent 1898 and 1899 in the Minors, resurfaced briefly in the National League in 1900, then jumped to the American League’s Baltimore Orioles (now the Yankees, not the modern Orioles) where he met John J. McGraw. In 1902 he joined McGraw in jumping to the Giants in the NL. 5. Playing multiple positions, he became the Giants’ full-time catcher in 1905. As a catcher he experimented with a batting helmet, padded masks, and shin guards. The latter two became staples during his own career. There is a lot of question who invented each. Although he is sometimes given credit for inventing each, Bresnahan, as far as I can tell, never claimed to have done so. 6. In the 1905 World Series, catcher Bresnahan led off for the Giants (unusual for a catcher) and led the team with a .313 batting average. The Giants won in five games. 7. In 1906 he led the National League with an OBP of .419, again unusual for a catcher of any era. 8. In 1908 he caught 139 games during the season. It was both his career high and an astonishing number for the era. 9. In 1909 he was traded to the St. Louis Cardinals to be player-manager. During his tenure (1909-1912) he finished as high as fifth once. He got along well with Stanley Robison, Cardinals owner, but Robison died in 1911. He was replaced by his niece Helene Robinson Britton who became the first woman to own a Major League club (and who is certainly worth a post at some point). After an initial period of getting along (I resisted using “honeymoon” here for a reason), they quickly fell out. Part of the problem seems to be that Bresnahan didn’t like working for a girl (See what I mean about “honeymoon”?). 10. 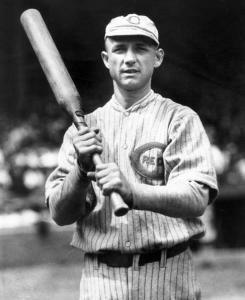 In 1913 he was sent to the Chicago Cubs where he was the backup catcher in both 1913 and 1914. In 1915 he was player-manager for the team. He didn’t do well as a manager, but made a lot of money. 11. He used the money to buy the Toledo Mud Hens Minor League team. He owned, managed, and occasionally played for the Mud Hens through the 1923 season. 12. He coached some for the Giants 1925-28, then for the Tigers in 1930 and 1931. Afterwards he held a series of odd jobs that helped him get by but had nothing to do with baseball. In 1944 he ran for county commissioner. He lost the election and died of a heart attack on 4 December of the same year (I’m not about to speculate on cause/effect of politics and heart attacks at this point.). His death led to a spiking in interest about him and he was elected to the Hall of Fame in 1945. By 1910 there was nothing to indicate how important the St. Louis Cardinals would be to the 20th Century National League. The Cardinals in the first decade of the century were terrible. There was no change in 1910. For the entire period of the Deadball Era (1900-20) the Cardinals finished with the worst record in the National League. At least in 1910 they weren’t last. The Cards finished seventh with a 63-90 record, 40.5 games out of first. Manager Roger Bresnahan simply didn’t have a lot to work with at St. Louis, installing himself as the backup catcher and even pitching one inning of one game. He hit .273, stole 13 bases, had 15 doubles, scored 35 runs, and was easily the best player on a woeful bench. The entire bench failed to hit a home run (the Cards finished last in homers) and no one other than Bresnahan had double figure runs scored. Which brings me to the starters. Most of them were at least a bit better than the bench. First baseman Ed Konetchy hit .302, slugged .425, and led the team with 78 RBIs. 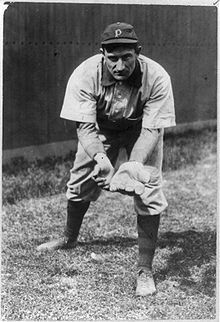 Outfielder Rube Ellis hit all of four home runs to lead the team. 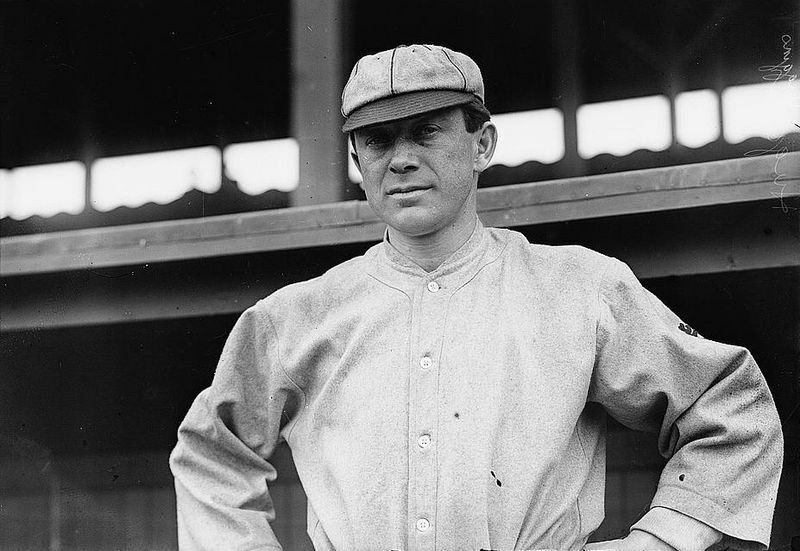 Miller Huggins, future Hall of Fame manager, led the NL in walks, stole a team high 34 bases, and his 101 runs scored led the team and was good for second in the NL. The team as a whole finished fifth in runs, sixth in average and slugging, and first in walks. The problem with the hitting was nothing compared to the pitching. The team finished last in ERA, strikeouts, shutouts, and first in hits allowed. Twenty-four year old lefty Johnny Lush ( please tell me he wasn’t a drinker) led the team with 14 wins and was the only pitcher with a winning record (14-13). Unfortunately he had more walks than strikeouts and more hits than innings pitched. Of the six Cardinals pitchers who pitched in 10 or more games, four gave up both more hits than innings pitched and had more walks than strikeouts. Bob Harmon managed to lead the NL with 133 walks while striking out only 87. His ERA was 4.46, a gigantic ERA for a Deadball pitcher with 33 starts. All in all, St. Louis didn’t look good in 1910 and didn’t look like it could compete for a pennant in 1911 (they moved up to fifth in 1911). The hitting wasn’t all that bad, although it wasn’t all that good either (Can you say “mediocre”?). But if the pitching didn’t improve the team would continue to flounder. The pitching didn’t, and the team did. I asked myself one day which National League team had the worst overall record in the Deadball Era. Answer: the St. Louis Cardinals. Considering what they’ve meant to baseball since, I find that a lot strange. By the start of the 1910 season, the last time they’d seen the first division was 1901. In 1909 they finished 56 games out of first. In 1909 they picked up a new manager, Hall of Fame catcher Roger Bresnahan. He immediately inserted himself as the backup catcher and almost as quickly came into conflict with most of his players. He was from the Giants, had been Christy Mathewson’s catcher, and was a student of John McGraw. The Cardinals weren’t very Giantlike and it created problems for Bresnahan. The team, as befits a seventh place finisher, underwent major changes going into the 1910 season. Half the starters were new. Ed Konetchy was still at first and hitting cleanup, but Miller Huggins was over from Cincinnati to play second and leadoff. Arnie Howser was now the shortstop and eight hitter, with Mike Mowrey, a previous backup, taking over at third and hitting seventh. The outfield consisted of holdovers Rube Ellis in left and Steve Evans in right, They hit second and fifth. The new guys was Rebel Oakes, like Huggins, from Cincinnati. He took the three hole. And the regular catcher was seven hitter Ed Phelps. The bench was Bresnahan catching, Rudy Hulwitt the backup middle infielder, Frank Betcher another backup infielder, and Ody Abbott as the fourth outfielder. It wasn’t much of a bench,, Bresnahan being the only one to manage .250 during the season. The pitching staff of 1909 consisted of six guys who failed to break even on the mound. Fred Beebe, Johnny Lush, Slim Sallee, Bob Harmon, Charlie Rhodes, and Les Backman are all pretty obscure, and there’s a reason for that. Only Sallee would ever do much. By 1910 Beebe was gone, replaced by Vic Willis who came to St. Louis from pennant winning Pittsburgh. Eddie Higgins, 1909’s bullpen man, managed only two games in 1910 and was ultimately replaced by committee. There just wasn’t much of an improvement for the staff over the offseason. There was very little reason for hope in St. Louis as the 1910 season began. The changes were insignificant, but at least the average age of the pitchers had gone from 23 to 26, so the added maturity might be a blessing. Also Huggins appeared to be a real player and Bresnahan’s fire was encouraging. But when you’ve just finished 56 games out, you need more than maturity and fire. You need talent. The Pittsburgh Pirates finished one game back in the National League pennant race of 1908, tied with the Giants. They hung close all season before dropping a key game to Chicago to put them out of the hunt in October. Losing wasn’t Honus Wagner’s fault, however. Wagner’s 1908 is one of the finest seasons any major league ballplayer ever produced. The numbers don’t look all that stunning at first blush, but when you consider the context, the times, the pressure of a pennant race, they stand up against almost anything. I read a comment by historican/statistician Bill James that argued Wagner’s 1908 was legitimately one of the five best seasons ever and could be considered number one. In the 2001 version of his Historical Baseball Abstract he gives it a 59 win shares. Except for a couple of 19th Century pitchers who threw every game, that’s the highest total he gives any season, including the 1920’s for Babe Ruth. What’s all the fuss about? Here’s Wagner’s 1908 in a nutshell. He led the league in hits with 201, doubles with 39, triples with 19, RBIs with 109, stolen bases with 53, a .354 batting average, a slugging percentage of .542, an on base percentage of .415, an OPS of .957, and 308 total bases. For good measure he finished second in runs with 100 (to Fred Tenney, Giants first baseman who had 101 and 40 more plate appearances), second in home runs with 10 (to Brooklyn first baseman Tim Jordan with 12), and had 54 walks, good for a lousy tenth in the league (Roger Bresnahan had 83). Want to put that in Major Lague perspective. Ty Cobb betters him in triples (20 to 19) but Wagner leads both leagues in all the other categories. His second in home runs and runs leaves him still second in home runs and he drops to fourth among all major leaguers in runs (Matty McIntyre and Cobb both have more than Tenney). Top all that off with a great glove at shortstop (in context of rough fields, gloves only slightly larger than a hand) and it’s quite a year. In context it’s even better. The league average for runs per team was 3.32 in 1908 and the league-wide batting average stood at .239. The latter was the lowest for either league (and throw in the Federal League for good measure) in the entire 20th Century until the American League managed to lower it in consecutive years: 1967 and 1968. Pitchers dominated and hitters suffered. With all that going againt him, Honus Wagner stepped up to the plate in 151 of 154 games and simply destroyed the baseball. The Pirates didn’t win in 1908. They did in 1909 and won the World Series. I supposed Wagner appreciated the outcome of 1909 much more than he appreciated his own efforts in 1908. We get to celebrate both.